When the Broad Museum in downtown Los Angeles opened with great fanfare in September, a big deal was made over the fact that admission was free for all. Thousands reserved tickets months in advance while others stood on long lines for same day admittance. But all good things must come to an end: KPCC, Southern California public radio, reports that starting June 11th, it will cost $12 to visit the entire museum. General admission to the museum’s permanent collection will continue to be free, but its first special exhibit will not be. While the Broad has advertised “free general admission” for years, the museum says that a paid exhibit like the one opening in June was always part of the plan. 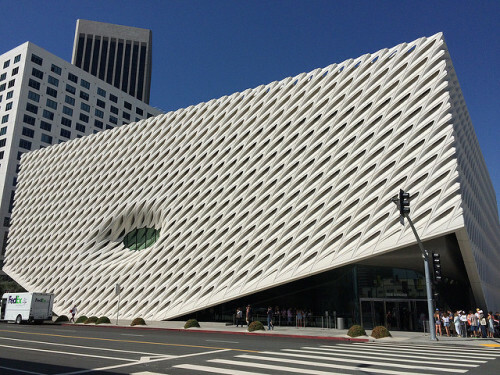 This is despite the fact that billionaire philanthropist Eli Broad, the museum’s founder and namesake, has been widely quoted saying that the museum would be free. The only other major museum in Southern California to offer free admission is the Getty. Both charge for parking. But the Broad isn’t alone in charging visitors for special exhibits—the L.A. County Museum of Art (LACMA) does it all the time. The Broad said the fee was needed to pay for a special curator, commissioned and loaned work, and installation. The Broad is sited on government-owned land, and is a linchpin in efforts to revitalize the Grand Avenue corridor downtown. The Broad hasn’t announced plans for any future special exhibitions, or whether it would charge for admission to them. Ironically, the news comes at the same time that the Los Angeles Times ran a big story on the Broad’s appeal to millennials and other younger arts patrons. The paper reports that average age of the Broad’s visitors is 32—14 years younger than the national average for art museum attendance in the U.S. It seems that the collection of postwar and contemporary art has attracted millennials. Its art is colorful and edgy, and it has a reputation as being “not stuffy.” The museum’s downtown location, a growing entertainment and nightlife hub, also helps. “And it’s free,” says the Times article. Well, for now it is. Another factor is that because advanced reservation tickets are sold out months in advance, the only way to get in without a reservation is to wait hours in line. Observers say that young people are probably more willing than their elders to queue up. The line—typically 90 minutes long on weekends—turns into a bit of a social scene, as patrons grab snacks from nearby food trucks, gossip and exchange cellphone numbers, says the Times article. Social media has become a key way millennials find out about the Broad, from pictures and videos posted online. The Times reports that one out of four visitors heard about the museum through someone else’s social media feed. The Broad has also drawn celebrities, and that increases millennial interest—Katy Perry, Kate Hudson, January Jones, Reese Witherspoon, and James Franco have visited and posted photos online. The museum is also drawing a more diverse patronage, with 60 percent of the more than 400,000 people who have visited so far saying that their ethnicity was other than Caucasian. Seventy percent were younger than 34. LACMA reports the average age of its patrons at 40, still below the national average. “We’ve succeeded in attracting a diverse and young audience,” says Eli Broad, the museum’s patron. The Broad’s patronage is bucking national trends, which report that youth attendance at art museums and galleries has declined over the last decade. The museum’s location near other downtown museums, art galleries and restaurants helps, as well.